Ingredients: Strawberry infused Russian spirits, fresh muddled cucumber, topped with French bubbly and club soda. What better libation inspiration than a Prohibition-era speakeasy? Amidst a particularly unassuming location, Barreled at the Lift is a sly addition to the Charlotte craft cocktail scene. The name, partly inspired by its central proximity to an elevator, pays homage to the secret barrels that stored liquor in the 1920s and early '30s. Though you'll have to look closely to find this joint, tucked in a shopping center off Woodlawn, it's worth the gamble. The interior is oozing with character via its damask wallpaper, dim lighting illuminated by gas lanterns and barrel accent tables. The smoky atmosphere, induced by a plethora of hookah flavors, is wonderfully fitting. Barkeep Neal Cauble recommends the Boardwalk, served in a mason jar with strawberry garnish. Co-owner Terri West, however, suggests the cocktail with the quirky name. "The typical martini has gone to the wayside," she says. To bring a variation of it back, try the Giggle Water, a gin drink served on the rocks. Historically inspired, Giggle Water was slang in the 1920s for "intoxicating beverage". At Barreled, we are focused on providing superior customer service, delicious muddled libations, and unmatched hookahs in a relaxing, cozy 1920s style atmosphere. In addition, our primary goal is to make you feel special at Barreled and ensure you always have a blast! With a variety of offerings to choose from, we’re confident you’ll be happy with the experience. Look around our website and if you have any comments or questions, please feel free to contact us. We hope to see you again! Check back later for new updates to our website. There’s much more to come! We always accept reservations for birthday parties, other special events, and/or just a night out on the town. Contact us by phone, email, or message. Please tell us the day and time you would like the reservation and how many people will be in your party. Our furniture and sections are set up to accomidate you and we are always re-arranging. In addition to being a Speakeasy Bar and Hookah Lounge, we love helping out the community and raising money for different charities. The charities that we have helped thus far are the firefighters in West, Texas that were involved in the fertilizer plant explosion, the One foundation for the Boston Marathon Bombing, and the Lupus Foundation Charlotte Chapter. Please contact us, if you would like to team up with us to help out a charity that is close to your heart! *As a politically neutral small business, Barreled at the Lift, reserves the right to refuse to work with any charity or fund raising group which may be considered politically slanted or controversal in any way. 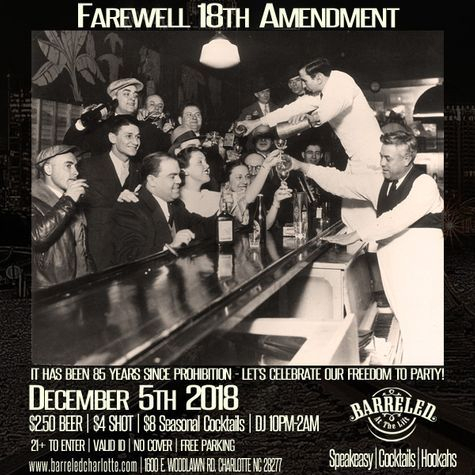 Wednesday, December 5th is the Anniversary of the repeal of prohibition (December 5th, 1933). Celebrate this momentous event with us. Happy Drinking - Cheers! © 2018 Barreled at the LiftSpeakeasy Bar and Hookah Lounge. All Rights Reserved.